Think about those people in your life that always make you smile. You are about to meet another one :). Our guest has this incredible personality. She's bubbly with a hint of honesty. The type of honesty that lets her say whats on her mind. It immediately makes you feel comfortable and let's you know that you can trust her. Lauren Craig is the owner of Eccentrics Boutique in Carterville, Illinois. She has this super power that makes others feel comfortable, happy, confident, gorgeous, courageous, fearless, and so much more. During this conversation we breakdown that super power and get to hear some of the real struggles Lauren has gone through to keep delivering those smiles for her customers. -How she found her niche. -The worst job she ever had. -The most rewarding part of her business. -What she did when her business was threatening her marriage and family. -How she wants to be remembered and so much more. This episode will give you the perspective you need to go create more defining moments with the people you love most. Go out there and be intentional! This episode of the Creating MeaningFull Moments Podcast is brought to you by MeaningFull Books. Use code ECCENTRICS to save $20 on your MeaningFull Book purchase. Offer ends February 8th. Jared Gravatt is one of the owners of Crown Brew Coffee Company in Carterville, Illinois. They are SUPER intentional with their business. You can't not love their approach to business and how they are using it to have a positive impact on the world. This episode is a real treat. Here are some of the things you will learn. - What inspired Jared when he was younger. -How Crown Brew Coffee started. -Early lessons of starting a business. -How your purchases can impact the world. -How to build a beautiful brand. If you are enjoying the Creating MeaningFull Moments Podcast please write a review on Apple Podcast App. Share the episode with those who may find value in it. Also, in case you missed it. 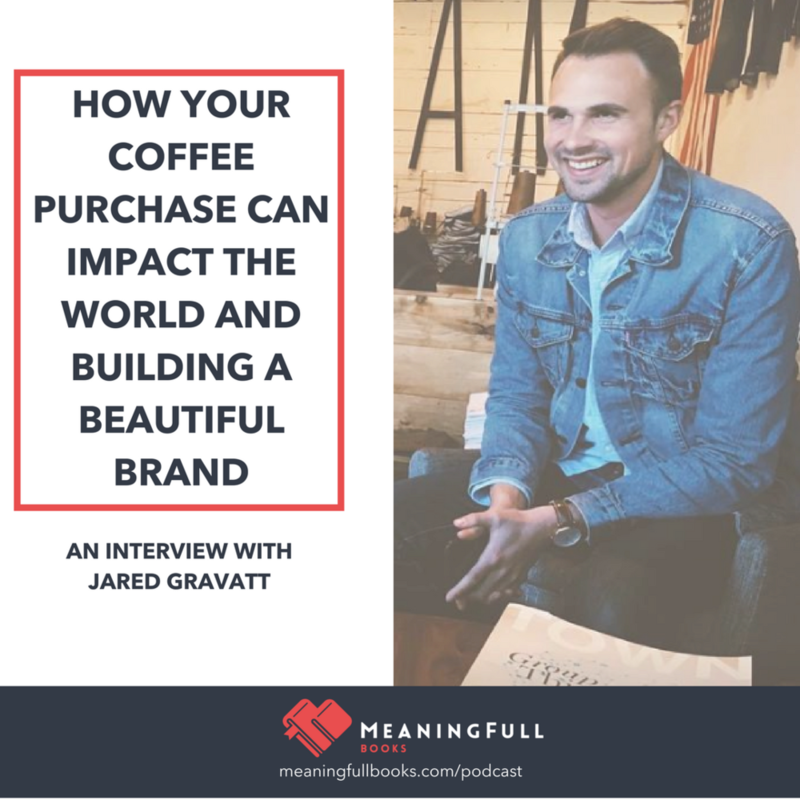 You can save $20 on a MeaningFull Book purchase by using the code COFFEE. Visit www.meaningfullbooks.com to purchase your journal. When disaster strikes what do you do? Our guest today ran toward the devastation. Kali Turner and her sister, Britnie, didn't have a plan but they knew they could help. Several months later they are still doing everything they can to help the British Virgin Islands rebuild. Listen to this episode to learn how Kali is using media as a force for good. She lives in Nashville, Tennessee and is using her media background to bring the BVI back to life. Bringing awareness and exposure to the current reality there can help others stimulate the economy and inspire growth. You can help her by watching this video and subscribing to Aerial Produced Youtube Page. As always, thank you for listening to the Creating MeaningFull Moments Podcast. I hope this episode inspired you to create more defining moments in your life. Your body is the vessel. It helps you accomplish all your dreams and allows you to bring your gifts to the world. If you are anything like me, you may take it for granted sometimes. Our guest today, Justin Raby, will help you realize how quickly things can change. He will offer a perspective that makes you think twice about the way you are taking care of your body. His circumstances frustrated him. He felt sorry for himself. He had a bad attitude with those closest to him and wasn't taking his condition seriously. Eventually, he made an intentional decision to change the way he was approaching the hand he was dealt. -How a perfectly healthy person can develop diabetes. -How he made the decision to change his bad attitude. -How you can respond to things out of your control. -How to pursue life aggressively. Thank you so much for listening. Make sure you subscribe at the Creating MeaningFull Moments Podcast. Sharing the episode and/or writing a review is appreciated more than you know. One takes 27 seconds and the other takes two minutes. This serve as encouragement and allow us to keep producing these conversations. Most people are not connecting with the ones they love because they don't know how. We've created a proven journal (30 pages) writing process that helps you transform your ordinary words into a book full of meaning. Staying connected and showing how much you care shouldn't have to be so hard. We can help you show how much you care at MeaningFull Books. Have you ever had one of those moments where you felt like you were exposed? A time when you realized you needed to raise the bar? Our guest today reflects on two of those types of moments. He called them a "mental wake up". He had to make a choice. He could keep carrying on the way he was or choose to be better. He chose to be better. For his children. For his wife. For the safety of him and the other police officers he works with. 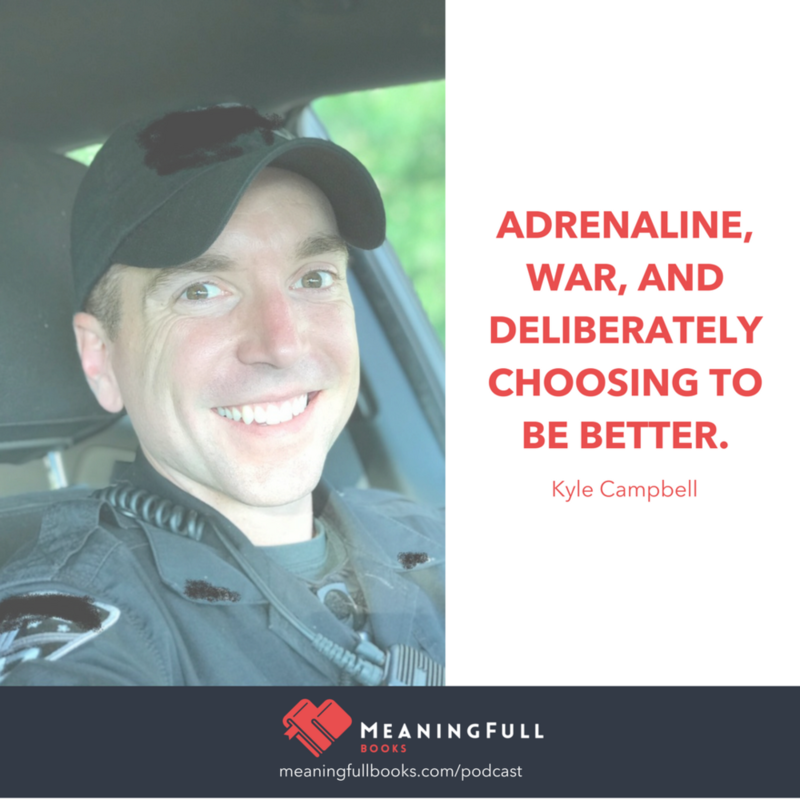 Listening to this conversation with Kyle Campbell will help you make the choice to be better the next time you encounter an experience where you don't feel like you measure up. -The enemies of war and multiple war stories. -The emotional aftermath of war. -What he believes is the root cause of problems. -The hardest he has ever worked for something. -A story about a police chase. If you enjoy this episode then you should write a review. Thank you for your continual support. Keep being intentional and keep creating more defining moments with the ones you love. Winning cultures are special. They are also hard to create. In this episode of the Creating MeaningFull Moments podcast we sit down with Coach Kerry Martin to talk about creating winning cultures. -What motivated him when he was younger. -How he shifted from a result driven mindset and focused more on the process. -He tells a story about transformation. -How he wants to be remembered. Coach Martin will leave you feeling refreshed and energized. He will help you realize that you can't get where you want to go without other people. Be sure to write a review on the apple podcast app if you enjoy this episode. You can also visit www.meaningfullbooks.com/podcast to see some of the other episodes. Part II of our conversation with Dustin will make you feel like you can overcome any challenge life throws your way. His family went through an absolutely tragic time. He lost both his sister and father in a matter of two years. About a mistake he made and how he never wants you to make the same one. What to do when you are frustrated with God. How to create more meaningful moments in your life. An example of what authentic love looks like. Thank you for listening in to the Creating MeaningFull Moments Podcast! Dr. Michael Gervais is a world renowned sport psychologist. I recently listened to him speak about one of the gratitude habits we have discussed on The Creating MenaingFull Moments Podcast. His insight blew me away and gave me a passion about encouraging you to take action and execute this habit. In this episode I review some of the scientific reasons he believes we feel anxious and how we can combat it. Listen. Share. Write a review! If you are interested in learning more about his work here is a link to his site. If you are in the people business then you need to hear this episode. The Garden Grove Event Center used to plan and coordinated 18 weddings a year. Under the leadership of Melissa Ray Roach they have successfully grown that number to 82 smiling couples a year. She is vibrant and full of energy. She knows how to take care of her customers and she shares those keys with you. Melissa has also overcome the unthinkable. She courageously shares the story of losing her mother at a very young age. What she had to experience is something nobody should every have to go through. It took her nearly two decades to transform the meaning she gave the circumstances she was dealt. She talks about who helped her do that and how you can too. It's truly special to see people like her turn tragedy into positive impact on the world. You will love this episode! Want to learn how a MeaningFull Book can help you? Listen to this live radio interview with Paxton Guy. We highlight a recent success story of a mother who wrote a book for her daughters. Everything has to start with gratitude. There is a mind-body connection with gratitude. The more grateful we are the better we feel. The better we feel the greater the chance we have to bring our best selves to the most important people in our life. Today's episode is the first of a five part series. They are short (Under 10 Min). 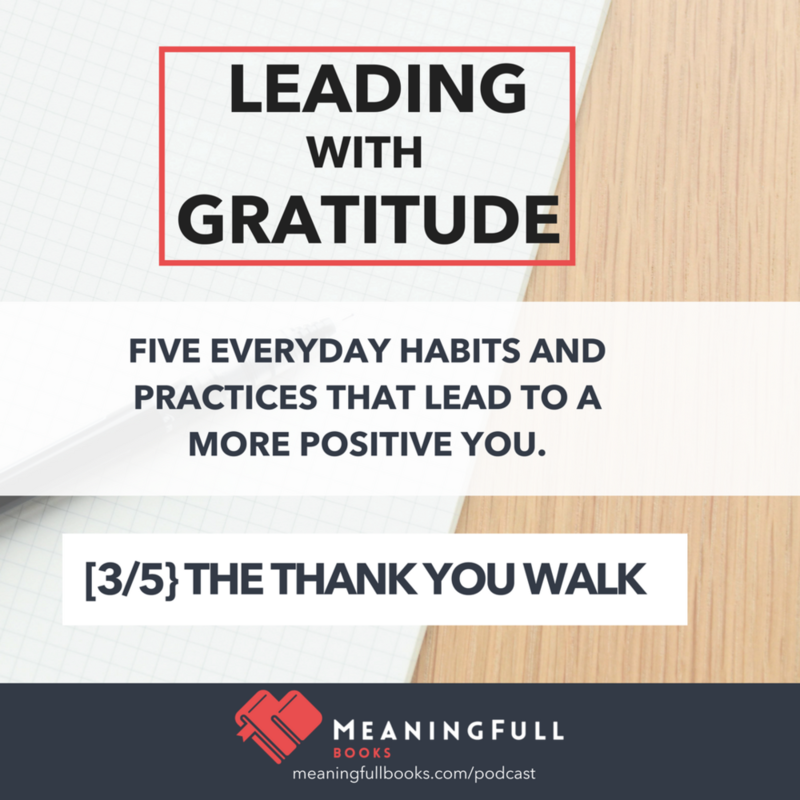 I'm addicted to learning new gratitude practices. I've experimented with several. I've also hear about some others that might be helpful for you. This series is designed to give you some simple strategies you can execute in your life. The underlying purpose of those exercises is to help you lead a happier and more positive life. Enjoy! Share! And have a wonderful day! We never know which one will be our last. Have you ever felt like you didn’t belong? Our guest this week opens up about a time he felt like he was out of his league. After making it to Hollywood on American Idol he moved to Nashville to chase his dream as a musician and singer. The talent that surrounded him became intimidating and left him feeling stuck. He was demotivated and not in a healthy place. A mentor enters the scene and builds a relationship with Dustin. Through this story you will learn how important your transparency with others can be. You’ll feel inspired and not alone. You’ll come away with some tips on what you can do when you feel like you don’t belong. Listen in to the Creating MeaningFull Podcast tomorrow! I’m grateful for Dustin for sharing his powerful story. December 16th is our workshop for parents. Register here! An episode about stepping up and leading during a traumatic time. This episode will have you on the edge of your seat. Jason and his wife, Ashley, endured major complications with the birth of their two twins. He talks about fulfilling the role he had to during that time. What motivates him. His answer inspired me to be a better husband and person. What his most meaningful moment has been and much more..
Before we jump into the show today it is important you know about the one-day sale we are running for Cyber Monday. (Nov 27th). I used to really dislike the idea of broadcasting my "personal brand". Our guest today helped me realize how crucial it is to reconsider my initial hesitations. He made me think about personal branding differently. Joe Szyynkowski, the founder of The Upwrite Group, helped me realize that personal branding is an extension of the impact we can have on others. You have so many gifts. If you don't update your linkedin profile or resume you run the risks of suffocating those gifts. Yo need to make sure others know what you do well and what you are working on. Our episode today will remind business professionals and young job seekers how to amplify one of your most important attributes... your personal brand. To learn more about Joe and the services his team offers visit The Upwrite Group. Thanks for listening to this weeks episode. I want you to think of someone that might benefit by hearing this episode..... I'm waiting. Now take 10 seconds and share this episode with them. The advice in this episode could literally land them their dream job. It's worth your time. Be intentional today and create more defining moments. Tomorrow is Thanksgiving!!! Use these questions while you are with family and friends this weekend. Also, make sure you listen in on Monday for the one-day Cyber Monday promo code. You can subscribe to the Creating MeaningFull Moments Podcast here. Have a wonderful Thanksgiving and create more defining moments with the ones you love. #010: Greg Cook - Turning Your Negative Life Situations Into Positives. A Successful Businessman Overcomes Cancer. Have you ever experienced one of those heart wrenching moments? One of those times when everything in your life instantly changes. A family members health has been compromised. A loved one passes on. A friend calls with some scary news. Those moments are tough and eventually we are all likely to experience them. Our guest on the Creating MeaningFull Moments Podcast heard the words, "You have cancer" at the young age of 24 years old. Everything in his life changed in that moment. Greg Cook is the founder and CEO of Cook Portable Warehouses. He leads over 250 employees and has built his company from the ground up. He's overcome obstacles in business and life. -The defining moment that helped him overcome cancer. -How to think about success. -What it takes to win with your family and your business. -The keys to turning negative situations into positives. -And all sorts of other great advice. He is a great man. I promise you will feel the same way and be glade you listened. You'll likely be spending time with family next week and I want to help you make the most of your time together. I used to leave holiday gatherings feeling like I missed an opportunity to connect more with family. After struggling through this for a few years I realized I was to blame. I wasn't being intentional. Literally, there was nothing I was doing to enhance the depth of conversation. "How did I just sit with my grandfather for an hour and not learn one thing about his past?" If you want to avoid this feeling and and take advantage of your time with family this podcast series if for you. Everything starts with intent! The holidays are right around the corner and you should consider writing a MeaningFull Book this year. It's a simple way to step out of the busyness and show your true appreciation for the ones you care about. Visit www.meaningfullbooks.com to get yours today. #008: Samantha Sambursky - Parenting With Courage. Wisdom From A Resilient Mother. Mothers across the country will feel like they are not alone after listening to this episode. The courage and strength of Samantha Sambursky and her family is beyond inspiring. Samantha has four children under the age of seven. She's miscarried twice and spent over 11 weeks in the hospital with her fourth child. She defines courage. She is the first to admit that courage wasn't self produced. She offers up advice on how to be there for others when they are going through a difficult time. She gives advice on being a mother in different seasons of life. Overall, she leaves you with a perspective you'll never forget. Cherish this interview and share it with those out there who might need to hear this story.